The iOS Mail app makes it easy to view only Unread Emails on your iPhone or iPad. This can really be helpful in case you get loads of emails and find it difficult to deal with them due the sheer number of read and unread emails sitting in your inbox. 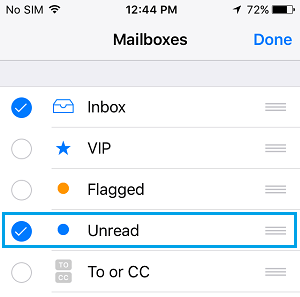 One easy way of accessing and viewing only the Unread emails on your iPhone or iPad is to make use of the in-built Unread Mail Box within the Mail App on your iPhone. 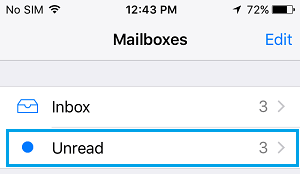 Follow the steps below to enable the Unread Mailbox on your iPhone or iPad and see only Unread Emails. 1. Tap on the Mail app on your iPhone. 2. Next, tap on Mailboxes, located at the top-left corner of the screen. This will take you to the Mailboxes screen where you will see iPhone’s built-in Mailboxes, followed by other Mailboxes that you may have created. 3. Tap on Edit from the top-right corner of your screen. 4. On the next screen, you will see Unread – Select Unread by tapping in the circle next to it. 6. You should be back to the Mailboxes screen where you will see the new Unread Mailbox You will also see a number next to Unread indicating the number of Unread emails that you have in your account. 7. Next, tap on Unread to see the list of emails that you have not read. 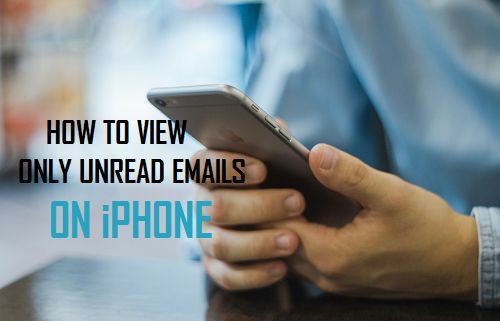 While the built-in Unread Mailbox feature on your iPhone is quite useful, you need to be aware that it can only display unread emails from your Inbox. Unread emails from other Mailboxes that you may have created to effectively manage your emails will not be displayed in the Unread Mailbox. Hence, you will also need to follow this second method which is capable of finding Unread Emails from all Mailboxes. 2. While in Unread, Inbox or any other Mailbox, tap on the screen and slide it down. You will see a Search box appearing at the top of the screen. 3. 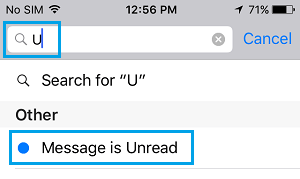 Simply start typing Unread in the Search box and you will see a suggestion ‘Message is Unread’ – tap on the suggested item and you will see a list of all Unread emails in your account. 4. Now, tap on the screen again and slide it down. You will see two more options below the search bar that will allow you to search All Mailboxes or just the Current Mailbox. 5. Tap on All Mailboxes to see the list of all Unread Emails on your iPhone. Tapping on the Current Mailbox tab will show you the list of unread emails in the Mailbox that you are currently on. You should be able to manage your emails better by using the two methods as described above. These methods make it easy to filter Unread Emails, allowing you to focus on them and respond to them right away. However, in case you do not have the time to respond to emails right away, you can flag important emails that require action from your side. Later on you can come back to the flagged emails and respond to them as required. Flagging emails and enabling the Smart Mailbox called ‘Flagged’ on your iPhone is easy. You can learn more about this at: How to Flag Email Messages On iPhone and iPad.